Two photographers Shannon Johnstone and Fred Levy are using their gifts to help dogs. See their beautiful photos and learn about their efforts. It is no secret to most pet owners that our pets make us feel good. But did you know that your pet can actually help you get healthy and stay healthy. 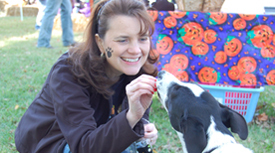 Agape Animal Rescue celebrated 10 years and almost 800 lives saved at their Glitter & Glam Fundraiser this year. Bear, a Border Collie mix was hit by a car on Sept. 25. Let’s celebrate the people & organizations that helped save his leg and ultimately his life.